Bourgault, M., Brand, J., Tausz-Posch, S., Armstrong, R.D., O'Leary, G.L., Fitzgerald, G.J. and Tausz, M. 2017. Yield, growth and grain nitrogen response to elevated CO2 in six lentil (Lens culinaris) cultivars grown under Free Air CO2 Enrichment (FACE) in a semi-arid environment. European Journal of Agronomy 87: 50-58. Lentil (Lens culinaris) is a fairly drought-tolerant legume or pulse crop, well-known for its nutritive value. It is particularly popular in Asian and Middle Eastern countries and over the past half-century its global production has more than quadrupled. On the scientific front, however, Bourgault et al. (2017) say there is "little published information on drought tolerance characteristics and no information on potential intraspecific variability in the response to elevated CO2 in lentils." Hoping to therefore provide some information in this regard, the team of seven researchers grew six lentil cultivars at the Australian Grains Free Air CO2 Enrichment (AGFACE) facility near Horsham, Victoria, Australia, studying this crop's response to atmospheric CO2 and drought. To accomplish their objective they grew six cultivars, including Boomer, PBA Giant, PBA Ace, PBA Jumbo, Nipper and 05H010L-07HS3010 (abbreviated HS3010 hereafter) under either ambient (~400 ppm) or elevated (~550 ppm, during daylight hours only) CO2 levels over the course of three moisture-varying growing seasons (frequent rainfall in 2013, initial wet season followed by terminal drought in 2014 and a relatively droughty year in 2015 that was alleviated with several irrigation events). No nitrogen fertilizer was applied during any of the growing seasons. And what did their experiment reveal? No cultivar-related differences were found in any of the measured growth parameters under elevated CO2 so the measurements of all cultivars were pooled. Observations revealed a wide range in the response of lentil to elevated CO2 among the three growing seasons, such that there were 32, 138 and 18 percent increases in grain yield relative to ambient CO2 levels in 2013, 2014 and 2015, respectively. Such relative increases translated to an approximate 0.5 t ha-1 enhancement (as shown in the figure below). Several measurements were also made with respect to plant nitrogen (N) concentration and content. Above-ground N concentration at flowering was found to decrease by 4% under elevated CO2, whereas the total N content increased because of "greater biomass under elevated CO2." 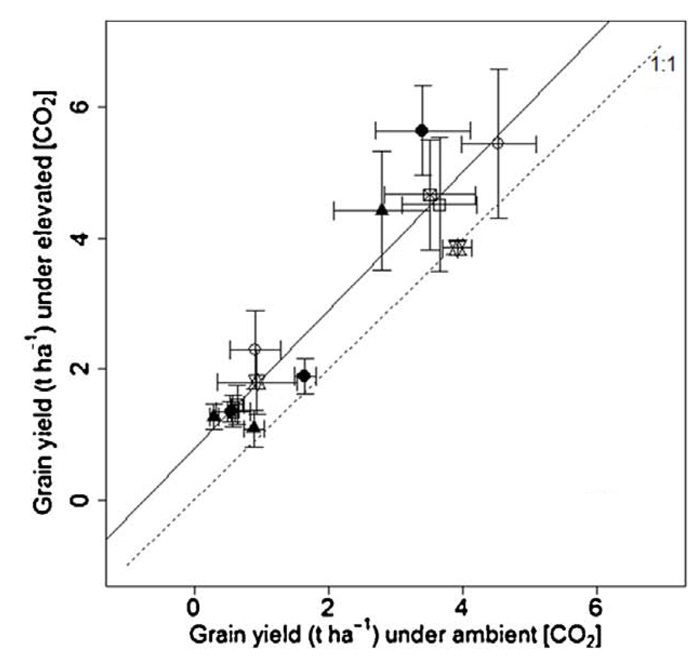 Grain N concentration, in contrast, was only slightly decreased (by 2%) under elevated CO2, while the nitrogen harvest index (nitrogen content in grains divided by the amount of nitrogen in above-ground biomass) was higher under elevated CO2. In light of the above, it would appear that lentils will experience future CO2-induced growth enhancements, even under conditions of drought. Furthermore, lentils will have higher total N contents and only slightly less N concentrations, which latter deficiency would likely be eliminated via a minimal application of N fertilizer. Figure 1. Effects of elevated CO2 on grain yield of six lentil cultivars across three growing seasons (2013-2015). Means are presented as averages ± standard errors over four replicates. Source: Bourgault et al. (2017).